I kept bumping into Solanin in many automated suggestion lists (those that seemed to predict what I may like, based on my tastes). A few months ago, I decided to trust these suggestion algorithms and pick it up. In my opinion, it is a coming of age story of the protagonist, Meiko Inoue. Somebody who has read the manga might hurl at me and say, ‘She is already a grown up. How can you say it is a coming of age story?’ To that I’d ask them to hear me out. (Top) The Viz Signature edition cover. (Bottom) The two volume Japanese edition covers. Every human comes of age at least twice in their lives. The first is physical. The second is metaphysical. Most classical books that can be classified as coming of age tales usually have a teenage protagonist, who along with their physical growth, also attains a spiritual awakening. Truth be told, most of the good bildungsroman tales focus much heavily on the latter. The former doesn’t make for good literary fodder. This manga is no exception. Meiko is a college graduate and has a day job as an office lady. She had already come of age in the physical sense. What we are treated with is the classic definition of bildungsroman – i.e., a novel dealing with one person’s formative years or spiritual education. The manga opens with panels depicting our protagonist and her love interest, Naruo Taneda, living in their Tokyo apartment – one whose rent is so high that they are barely able to pay with their day jobs. Both are bored out of their minds with the poverty, the lack of meaning in their day jobs and the hopelessness associated with their then state of life. To top it off, Taneda doesn’t even have a proper job. And when Meiko quits her job and asks Taneda to quit his job, too, and focus on music instead, things aren’t that shiny anymore. That’s the starting point of the story. In many ways, Meiko acts like an irresponsible child. Not to mention, her indecisiveness fogs her end goals. In that respect, her boyfriend Taneda is leaps and years ahead. At the very least, he has a passion for making music and together with his bandmates, he dreams of making it big someday. Every bildungsroman tale needs a trigger. For Meiko, it comes too soon and too suddenly. Taneda, her only meaningful link to her existence, dies in an accident. 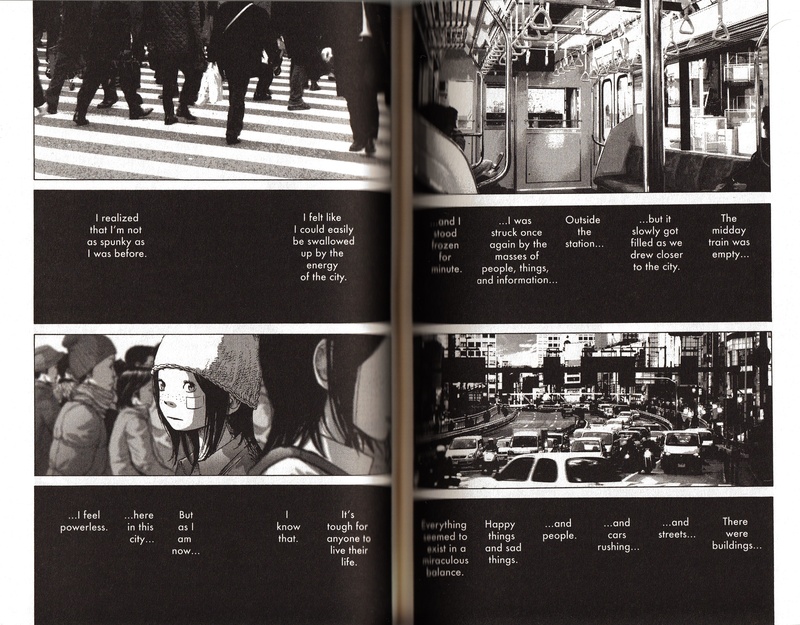 Over the first third of the book, the mangaka, Inio Asano, describes her lifelines in detail. These revolve around Taneda in some way or the other. His bandmates are her only close friends. Her relationship with her parents is akin to that of a rebellious teenager. In fact, early in the story, we are explicitly exposed to her feelings of disgust when she received any help from her parents. In a sense, this dependency may appear to be borderline obsessive. To her, Taneda is not only her lover but also a man who could do no wrong. The not-so-pragmatic decisions she takes during her time with Taneda, ultimately ends up putting more and more pressure on him. This is a burden she fails to understand during the time Taneda remains alive. This is perhaps the only serious confrontation our protagonist has with Taneda. Taneda’s pent up frustrations are evident in the panels. Yet he never raises his voice. The day Taneda dies, her life spirals into a state of absolute solitude. The manga, in essence, is a study of this solitude. While it is easy to focus on the melancholy of Meiko Inuoe, it may be important to step back and understand that it is not just her but a whole lot of other people who are equally devastated after the loss of Taneda. In some ways, this almost feels like a much mature take on AnoHana – only that, unlike AnoHana, the loss of Taneda ends up drawing people closer to each other. 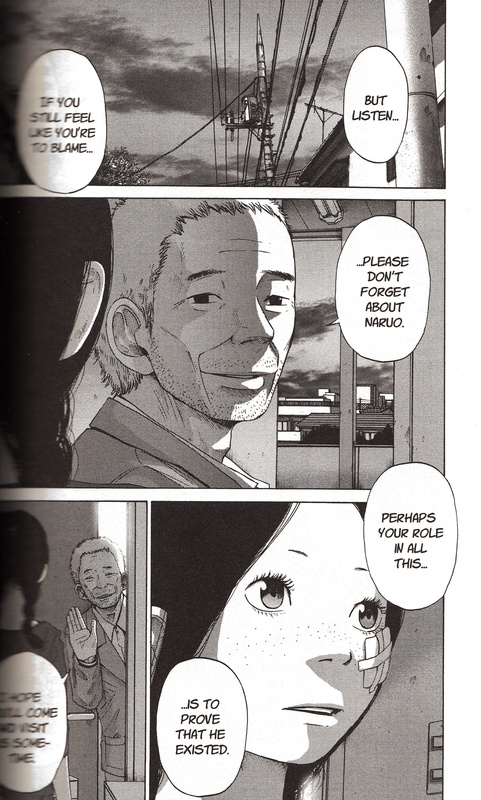 There is one very poignant section of the book where Taneda’s father comes to visit Meiko in order to collect Taneda’s belongings. It felt almost like a study of two solitudes. In the end, he leaves Taneda’s guitar with Meiko and passes on a flickering ray of optimism to her. Taneda’s father says something that One Piece fans would find familiar. “When does a man die? … A man dies when he is forgotten!” – Dr. Hiluluk. This is the second trigger to her coming of age story. Throughout the book, Taneda’s bandmates, Kato (bassist) and Rip (drummer), provide the necessary comic relief to the otherwise serious manga. They also form the support system that allows our protagonist to recover from the loss. The mangaka focuses on the lives of Kato and Rip, too, in the aftermath. They are as shaken by Taneda’s death as much as Meiko. Yet, they are strong characters. Maybe, not as strong as Taneda’s dad. There is one point in the story where Rip finally cries. It is one of the most heartbreaking sequence in the manga – more so than the panels that depict the death of Taneda. In isolation, these panels may appear to be too melodramatic. Yet, in context, they sit very well with the flow of the story. This is the only point where Rip finally sheds a tear in memory of Taneda. Rotti, the goofy band that Taneda used to lead, had ambitions of making it big in the music industry. More like an end goal where their passion will pay for their food. In a sense, the band as a collective also comes of age. When Meiko replaces Taneda and works hard to become as good as him, they form a support system that ditches the objective that Taneda had set. Instead, they play to heal themselves. It is ironical because Taneda’s objectives of making it big in the music industry were not his in the first place. It was planted by Meiko. They play one last show before the book flashes back into the past – to the very beginning when Meiko wanted to join the band as a singer but gave up her place to Taneda. The mangaka doesn’t linger long in the past. He slams us back to their current reality – Meiko moving to a smaller house and being helped by her friends. This is almost symbolic of her leaving a part of her life behind and moving on. Many people love the book for the slice-of-life nature of the presentation. Slow, introspective scenes get intermingled with scenes that just describe the ambience. There are panels that are just silent. These are interjected by black boxes that flash the thoughts of our protagonist (and in some cases, the thoughts of Taneda). In spite of the visual grammar that borrows heavily from the genre, just categorising the book as a slice-of-life manga would be an understatement. 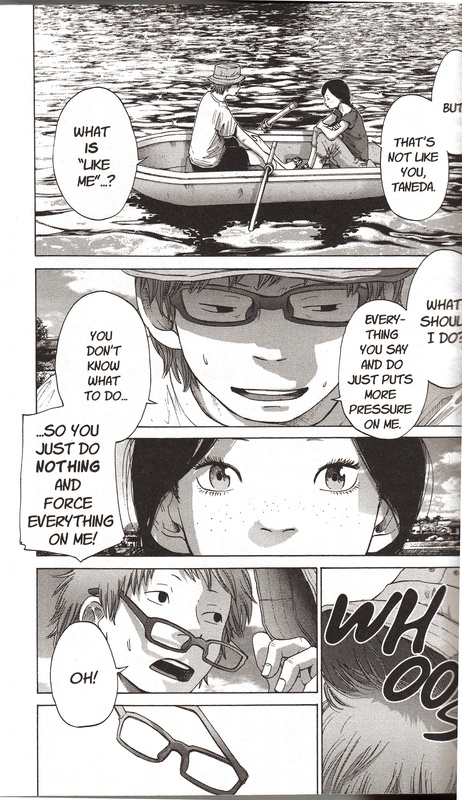 Inio Asano uses this technique of altering silent panels with stream of consciousness monologues quite frequently throughout the manga. 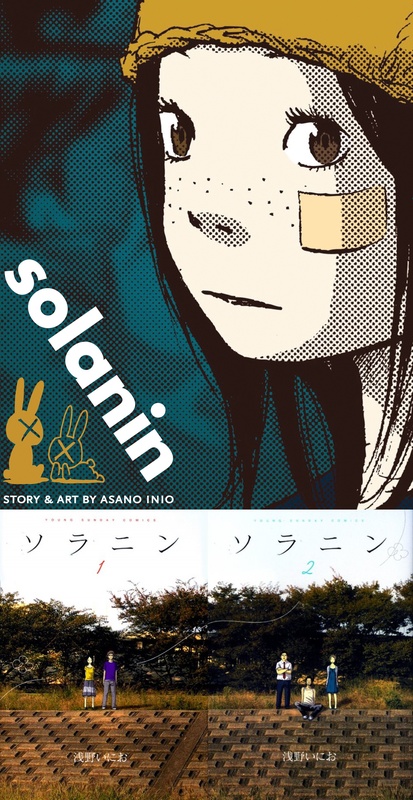 Inio Asano’s postscript seemed to suggest that it is merely an observational exercise, dropping the wobbly genre needle to the slice-of-life groove. In my anxiety and impatience, I felt that all I could do in my manga was try to get a true depiction of the times as experienced by my generation. There is nothing cool about these characters. They’re just your average 20-somethings who blend into the backdrop of the city. But the most important messages in our lives don’t come from the musicians on the stage or stars on television. They come from the average people all around you, the ones who are just feet away from where you stand. That’s what I believe. Others would want to get into it because of the romance. It is not exactly a traditional romance manga. There is no romantic resolution in the end. Yet, whatever panels are dedicated to the romance of Taneda and Meiko, they are done beautifully. I would argue that it is in fact neither. The tones of a great bildungsroman story forms the heart and soul of this excellent manga. The artwork in the manga is very clean. Maybe not as clean as gag mangas but as clean as it could have been. The artwork suits the seinen genre very well. 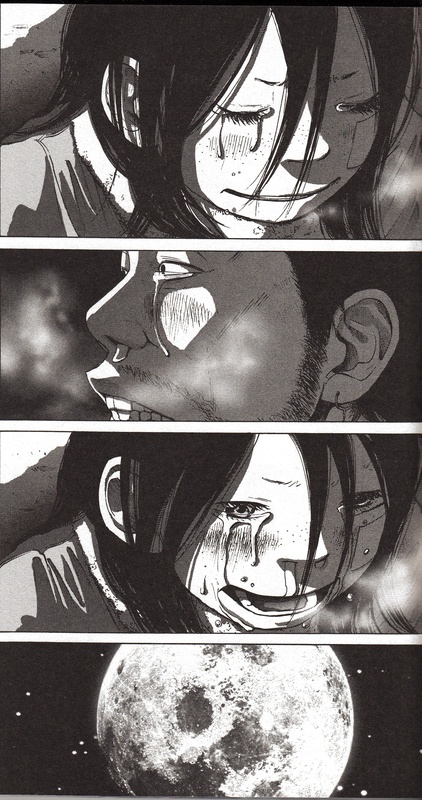 The mangaka, Inio Asano’s art style, is very unique and distinguishable. I am sure that I would be able to identify his work amongst a pile of others. Although his characters have a roundish feel to them, de-featuring most of the angles to pull them away from a realistic art style, the backgrounds, the environment and the ambience are faithfully reproduced in black and white. Viz has released the manga in a larger trim size under their Viz Signature label. The entire run of 28 chapters (Weekly Young Sunday, June 30, 2005 – April 6, 2006) has been collected in a single volume. It is one of the best single volume mangas I have in my collection.